Ernest Small Paving was founded by Ernest Small in Buckhannon, West Virginia in 1999 to deliver exceptional asphalt services to the area. We are a proud family-owned and operated local business. After a lifetime of experience working with his father’s paving company, Ernest Small began serving the community’s paving needs at the age of 16. The company was founded on the premise of providing honest, reliable work at a reasonable price – and we continue to serve our customers with the same values today. At Ernest Small Paving, we are intently focused on customer satisfaction and abiding by fair business practices you can rely on. We provide quality services and easy-to-understand flat-rate quotes. Our company is proud of our reputation of following through on our promises. We do what we say we will do – at the price that was included on your contract quote. Unlike some others, Ernest Small Paving will not renege on a price quote and change it on you. All asphalt services provided by Ernest Small Paving are completed in accordance with the best practices of the asphalt industry. 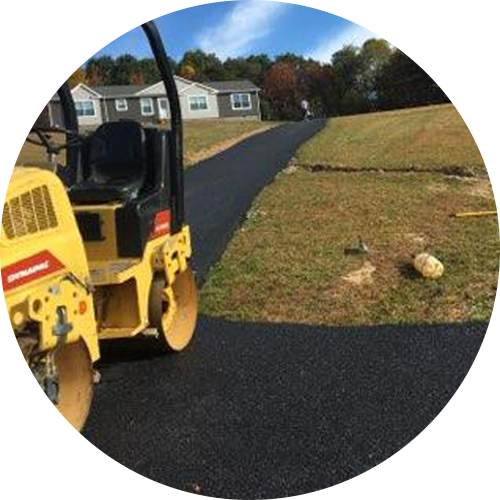 We professionally machine roll and lay your driveway and parking lot for exceptionally smooth results, durability, imperviousness to weather, and longevity. We will also perform hand work if it is required due to the nature of the project, or specifically requested by our customers. Quality Materials and Workmanship – Satisfaction Guaranteed! All of our asphalt services are fully guaranteed and your satisfaction is always our primary goal. At Ernest Small Paving, we provide the top-quality materials and workmanship you deserve. We view our partnership with you as a long-term, mutually beneficial business relationship. When you choose Ernest Small Paving for your residential and commercial paving needs, you join our long list of satisfied customers who we look forward to continuing to serve for many years. We hope you will keep us in mind for all of your maintenance and repair requirements, as well as new projects in the future. Thank you for allowing us to serve your asphalt needs for over 19 years!